The SP Peelers from IMC are amongst the fastest potato peelers on the market, offering you all the flavour of freshley peeled potatoes, with the speed and convenience of pre-prepared products. Not only are these peelers the easiest and quickest to clean, they're also built to last, with exceptional durability and outstanding reliability. So what you could spend on pre-prepared potatoes in the short term, you can invest in a peeler that will work for you for the long term. Handling up to 25kg per load (equivalent to full 56lb sack of potatoes) the SP25 Peeler is a cost effective-solution. The carborundum liner acts as a fill guide and the SP25 also features a robust stainless steel lid with secure push fit. Faster Peeling - At up to 600kg of potatoes peeled per hour, the SP Peelers are amongst the fastest available, making them ideal wherever high volume potato peeling is required. 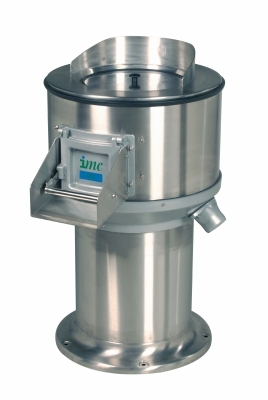 More Flexible - With a choice of pedestal heights to fit a tank or catering sink, a flexible hose or plumbed -in waste outlet on either side and the option of an intergrated filter basket, an SP peeler fits easily into your working environment. Quieter Operation - The motor and water inlet both run exceptionally quietly, resulting in an improved working environment, whilst the motor's cooler running temperature ensures optimum performance, efficiency and durability. Longer Life Peeling - The thickly gritted non-rusting cast aluminium plate is designed to be robust and offer a lomg service life. The carborundum non-rusting stainless steel cylinder liners can be reversed and relined for longer life and lower costs. Easier Cleaning - The hygienic brushed stainless steel finish is easy to wash down. Water and waste drain efficiently from the smooth cylinder base aided by large cast paddles under the peeler plate. The lid and peeling plate are quick and easy to remove for cleaning. Operational Controls - Control box (fixed to a wall bracket) with on/off buttons. Timer and continual run settings.